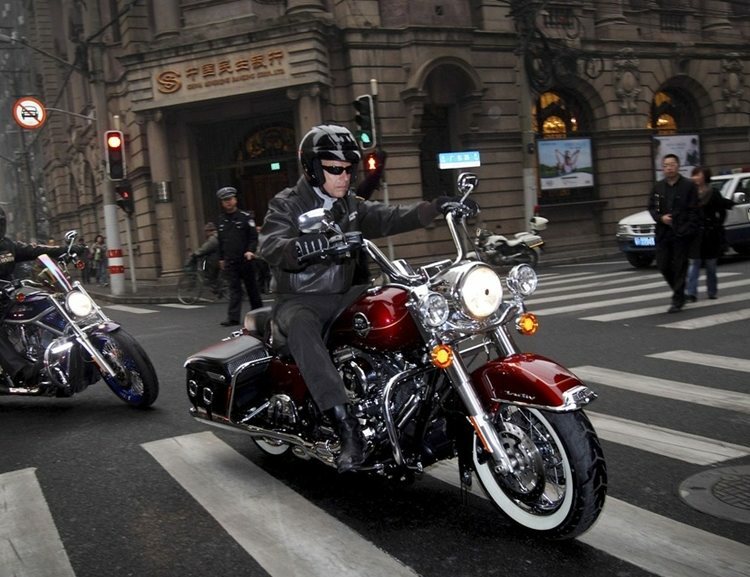 In a heady display of “feel the vib” and “look at me” doing that pursuit of freedom gig, the political poster child for human rights, dares onlookers of the patriotic possibility and the fact it’s not just something special for the American people as he rides his signature Harley-Davidson RoadKing Classic through the streets of Shanghai. Some might even call him showing off a bit since urban incomes average about $2,200 a year in Beijing where the bikes sell for $12K to $37K. Harley-Davidson opened its first store in China in April 2006 and the allure of its citizen’s growing spending power means the motor company is unwavering in its commitment to extract dollars from the world’s most sought-after-market… who cares if in Beijing and Shanghai, motorcycles are largely banned from most major streets and highways. In fact, Shanghai stopped accepting motorcycle registrations back in 2002 so, I wonder how Mr. Huntsman got that motorcycle registered? Was it shipped over or did he buy it there? In a country well know for reproducing (“copy”) everything, unlicensed Harleys have been smuggled in to the country for years so his would likely go unnoticed. Details, details…Don’t bore me with the details. The mandarin speaking Mr. Huntsman will resign as U.S. Ambassador to China on April 30th and according to Politico reports he might make a run for the Republican nomination in 2012. Adding fodder to this speculation is the fact he’s booked for a speaking engagement in New Hampshire in May shortly after his return. Interestingly, if a deal can’t be made and the government shuts down in less than 30 hours due to what looks like near-fatal-distrust of the two parties… I wonder how Mr. Huntsman will get back to the U.S. — charge it?! UPDATE: June 21, 2011 – Mr. Huntsman enters the 2012 Presidential race. Reuters report HERE.